Objective: Candidal species identification in malignant and potentially malignant oral lesions with antifungal susceptibility. Materials and Methods: Oral candidal carriage, strain diversity, and antifungal susceptibility of Candida were checked for the patients having oral cancer or precancer reporting to the clinics for 1½ year. Statistically significant patients were selected and a control group was taken. A total of 105 individuals were selected and divided into three different groups. Salivary samples were taken from all the individuals. Candida detection was done using Sabouraud's agar and candidal species detection on CHROMagar. In vitro antifungal sensitivity was done using antifungal disc diffusion method. Results: Candida was isolated from 88.6% of patients with oral cancer and 45.7% in oral precancerous group. C. albicans was the predominant species found in 100% of oral precancerous and 71% in oral cancerous patients. Other Candid a species found were C. tropicalis (9.7%) and C. krusei (19.6%). Antifungal susceptibility showed 4.3% sensitivity to fluconazole and 100% sensitivity to amphotericin B and nystatin. Conclusion: Oral Candida carriage was higher in oral cancerous group and majority of them were sensitive to amphotericin B and nystatin. Candida albicans, a diploid asexual fungus, is an opportunistic pathogen which is the predominant genus among the yeasts of the oral cavity.,Candida, though a commensal, can also cause oral mucosal infections in immunocompromised situations which are frequently seen in older individuals, infants, people infected with HIV, and individuals with cancer. Colonization may lead to either a sustained or transient saprophytic association with the host or localized infections of mucosal surfaces. There is significant association between histologically determined fungal infection of the oral mucosa and epithelial dysplasia.Candida might induce oral squamous cell carcinoma (OSCC) by directly producing carcinogenic compounds, for example, nitrosamines. It is suggested that the tubular hyphal structure of C. albicans might be important as this structure allows ingress of precursors from saliva and release of the nitrosamine product to keratinocytes, potentially initiating OSCC.Candida is frequently found in histological sections of leukoplakia. Some studies have suggested that Candida spp. isolated from leukoplakia lesions are able to produce the potent carcinogen N-nitrosobenzylmethylamine. There is a considerable circumstantial evidence which suggests that the Candida species may play a role in oral carcinogenesis. This study was an attempt to identify different Candida species in normal healthy individuals, potentially malignant and malignant oral lesions along with their susceptibility to antifungal drugs in vitro. All the patients reporting to the department of oral medicine and radiology between July 2013 to November 2013, with precancer oral lesions and oral cancer lesions. Institutional ethical clearance was obtained to conduct the study and written consent was obtained from the participating individuals. The inclusion criteria were based on clinically diagnosing and histopathologically confirmed cases of oral cancer and oral precancer. The cases with any other underlying disease or pathology were excluded from the study. A total of 95 cases were identified and confirmed histopathologically having oral cancer or precancer. Out of the selected cases, 74 agreed for participating in the study (77.9%) out of which 35 patients had oral precancer (Group 1) and 39 had oral cancer (Group 2). To reduce the bias and be statistically reliable equal number of participants (35) were selected in cancer and precancer group. A control group of 35 healthy individuals (Group 3) who volunteered were also selected with matching demographic parameters. All the selected patients were examined clinically and baseline parameters were checked. Saliva sampling using the oral rinse technique was performed for oral candidal carriage, strain diversity, and antifungal susceptibility of Candida. All patients were instructed to rinse their mouth for 60 s with 10 mL sterile phosphate-buffered saline (PBS). The rinse was immediately concentrated by centrifuging at 1700 rpm for 10 min. Supernatant was discarded and an inoculating loop was used to spread the concentrate onto Sabouraud's dextrose agar supplemented with chloramphenicol (10 mg/mL). It was incubated at 37°C for 48 h and the resultant growth was then observed. Creamy white, opaque, and smooth colonies suggested the presence of Candida [Figure 1] which was then further confirmed by Gram's staining. For strain diversity of Candida, CHROMagar was used. An inoculating loop was used to pick a small colony from the candidal growth and was then spread over the surface of CHROMagar plates. The plates were incubated at 37°C for 48 hours and growth was observed. This resulted in the formation of differently colored colonies [Figure 2]. Antifungal susceptibility testing was carried out using antifungal disc diffusion susceptibility method for yeasts with approved guideline M44-A given by the National Committee for Clinical Laboratory Standards (2004). Inoculum was prepared by direct colony suspension method. 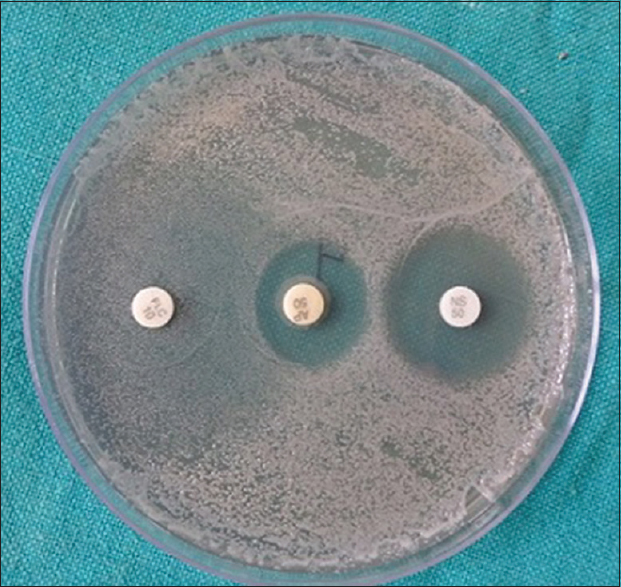 The Candida growth obtained on CHROMagar was picked using inoculating loop and subcultured onto Sabouraud's dextrose agar to ensure purity and viability. Colonies were suspended in 5 mL of sterile saline in a test tube. The resulting suspension was vortexed for 15 seconds and its turbidity was adjusted by visually adding sufficient sterile saline to inoculate the test plates optimally within 15 min. 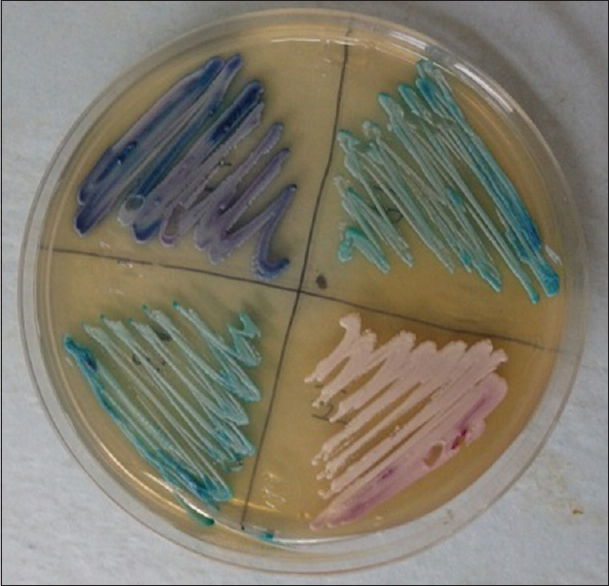 A sterile cotton swab was taken to inoculate the inoculum on dried surface of a sterile Mueller-Hinton agar + 2% glucose and 0.5 μg/mL methylene blue dye medium which was evenly streaking over the entire agar surface. The lid was left ajar for 3 to 5 min to remove excess moisture and antimicrobial disks were dispensed onto the surface of the inoculated agar plate. The antifungal disks used were fluconazole 10 μg, amphotericin B 50 μg, and nystatin 50 μg. The zone diameters were recorded with vernier caliper. Zone diameter interpretive criteria were used to accurately categorize the level of susceptibility of organisms to various antifungal drugs, based on the chart given by the manufacturer [Figure 3]. The statistical analysis was carried out using Statistical Package for the Social Sciences (SPSS Inc., Chicago, IL, version 15.0 for Windows). A total of 105 participants including 84 males (80%) and 21 females (20%), aged 25–70 years, were enrolled into the study. There was no significant difference in age among participants in Group 1 (50.51 years), Group 2 (49.73 years), and Group 3 (50.40 years). In Group 1 (oral cancerous), the Candida carriage was found to be 88.6% (31 out of 35), whereas in Group 2 (oral precancerous), it was 45.7% (16 out of 35). No positive specimen was found among the healthy control group (Group 3). Oral Candida carriage was significantly higher in oral cancerous group (<.001) compared to oral precancerous and healthy controls [Table 1]. C. albicans (80.90%) was the predominant fungal species found among the candidial positive samples in oral cancerous and oral precancerous patients. In Group 1, C. albicans was the predominant species found in 71% (22 out of 31) patients followed by C. krusei (19.6%) and C. tropicalis (9.7%). In Group 2, C. albicans was the predominant species found accounting for 100% of the Candida-positive patients [Table 2]. Of the three antifungal drugs used (fluconazole, amphotericin B, and nystatin), in the oral cancerous group, all the 31 (100%) candidal isolates were susceptible to amphotericin B and nystatin, whereas for the drug fluconazole, only 2 (6.5%) of Candida isolates were susceptible and the rest 29 (93.5%) of Candida isolates showed resistance to the drug. 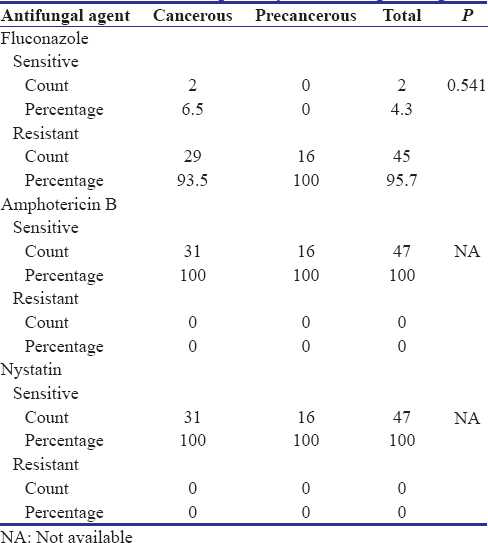 On the other hand in the precancerous group, all the 16 (100%) Candida isolates showed resistance to the drug fluconazole, whereas all the 16 (100%) Candida isolates were susceptible to other antifungal drug i.e. amphotericin B and nystatin [Table 3]. The prevalence of diseases caused by Candida species has increased in recent years. This is attributed to the increase in number of immunocompromised patients. Apart from causing opportunistic infections, Candida species have been found to act as a contributing factor for oral neoplasia. The first possible association between Candida species and oral neoplasia was reported in the 1960s.,Candida infection has been associated with malignant development in the oral cavity ever since it was found to cause candidal oral leukoplakia and to correlate with oral epithelial dysplasia.,,,,Candida-infected leukoplakia appears to have a higher rate of malignant transformation than other types.C. albicans has a very high potential to nitrosylate N-benzylmethylamine and is more likely to be isolated. Different researchers have used different methods for isolation of different Candida species from oral lesions in question. 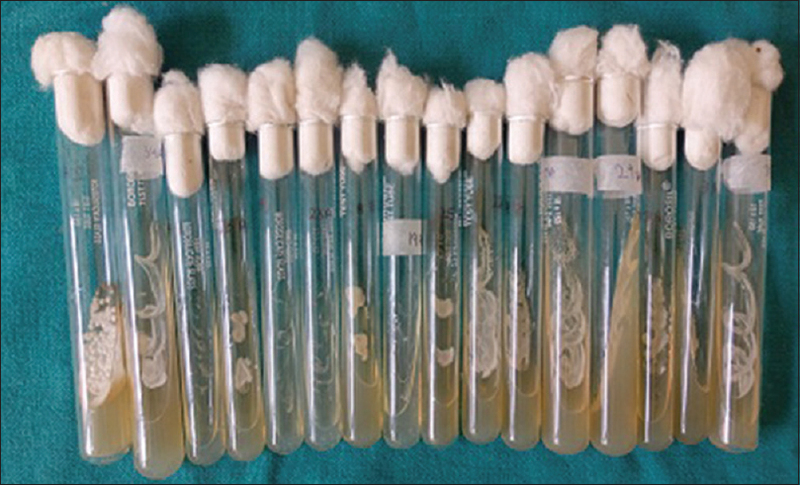 In the present study, oral rinse sampling method was used as it was advocated to be the most appropriate and sensitive technique for evaluating the overall yeast carriage when compared to imprint culture, swab, or saliva sampling technique. The candidal carriage was found to be significantly more in oral cancerous patients than oral precancerous patients. On the contrary, no candidal carriage was seen in healthy control group [Table 1]. These results were in accordance with a study done by McCullough et al. and Kumar et al., who reported that 74.7% of the patients with evidence of oral epithelial dysplasia had yeast isolates in the oral cavity. McCullough et al. reported a strong statistical association between increased oral yeast density, oral epithelial dysplasia, and oral squamous cell carcinoma, with the degree of epithelial dysplasia correlating with increased oral yeast density. On the other hand, 4.4% of the healthy controls also depicted candidal isolates in their study. It can be attributed to the usage of the swab method for sampling of yeast samples in contrast to saliva sampling method using PBS in the present study. The remaining isolates such as C. krusei and C. tropicalis were found exclusively in oral cancerous group. Safdar et al. also isolated C. tropicalis (18.4%) and C. krusei (9.6%) from patients with OSCC, whereas Davies et al. found C. tropicalis in 5% of the oral cancer patients. Presence of Candida nonalbicans may also signify increased malignant potential. The limitation of the present study was that no quantification of candidal carriage was done based upon type and duration of lesions. In the absence of clinical manifestations compatible with oral candidiasis, a positive culture result for Candida does not mean that the patient has oral candidiasis. The importance of the clinical diagnosis of the disease therefore must be underscored. However, the presence of Candida spp. within the precancerous and cancerous lesions indicate association with the opportunistic pathogen. Another limitation was no analysis of sequential isolates was applied longitudinally to monitor C. albicans infection. Some studies have suggested that C. albicans isolates recovered from oral leukoplakia lesions may be genetically different to those which typically colonize the normal oral mucosa. Since it was outside the preview of the present study, it could not be verified. Furthermore, the oral hygiene status of the patient should be taken into account which came as to be the drawback of this study; however, according to Darwazeh et al., oral hygiene status, as determined by the PI and the GI scores per se, does not affect oral candidal colonization in dentate patients. Further studies should be taken up to continue the research in role of Candida in premalignant and malignant disorders of the oral cavity. Candida species were closely associated with potentially malignant and malignant oral lesions with an increase in antifungal resistance to antifungal drugs. The frequent isolation of various opportunistic infections in patients with oral precancer and oral cancer indicates a need for effective treatment of various opportunistic infections as they can play a definite role in carcinogenesis and can lead to progression of the disease to be potentially lethal. Furthermore, in light of the present study, the antifungal resistance patterns should be taken into account before prescribing antifungal drugs. Mohd Bakri M, Mohd Hussaini H, Rachel Holmes A, David Cannon R, Mary Rich A. Revisiting the association between candidal infection and carcinoma, particularly oral squamous cell carcinoma. J Oral Microbiol 2010;2. doi: 10.3402/jom.v2i0.5780. Barrett AW, Kingsmill VJ, Speight PM. The frequency of fungal infection in biopsies of oral mucosal lesions. Oral Dis 1998;4:26-31. Kalantar E, Marashi SM, Pormazaheri H, Mahmoudi E, Hatami S, Barari MA, et al. First experience of Candida non-albicans isolates with high antibiotic resistance pattern caused oropharyngeal candidiasis among cancer patients. J Cancer Res Ther 2015;11:388-90. Glažar I, Prpić J, Muhvić Urek M, Pezelj-Ribarić S. Identification of Candida spp. In the oral cavity in patients with malignant diseases. Vojnosanit Pregl 2017;74:1066-70. Rautemaa R, Hietanen J, Niissalo S, Pirinen S, Perheentupa J. Oral and oesophageal squamous cell carcinoma – A complication or component of autoimmune polyendocrinopathy-candidiasis-ectodermal dystrophy (APECED, APS-I). Oral Oncol 2007;43:607-13. Shield KD, Ferlay J, Jemal A, Sankaranarayanan R, Chaturvedi AK, Bray F, et al. The global incidence of lip, oral cavity, and pharyngeal cancers by subsite in 2012. CA Cancer J Clin 2017;67:51-64. Bartie KL, Williams DW, Wilson MJ, Potts AJ, Lewis MA. PCR fingerprinting of Candida albicans associated with chronic hyperplastic candidosis and other oral conditions. J Clin Microbiol 2001;39:4066-75. O'Grady JF, Reade PC. Candida albicans as a promoter of oral mucosal neoplasia. Carcinogenesis 1992;13:783-6. Krogh P, Hald B, Holmstrup P. Possible mycological etiology of oral mucosal cancer: Catalytic potential of infecting Candida albicans and other yeasts in production of N-nitrosobenzylmethylamine. Carcinogenesis 1987;8:1543-8. Gall F, Colella G, Di Onofrio V, Rossiello R, Angelillo IF, Liguori G, et al. Candida spp. In oral cancer and oral precancerous lesions. New Microbiol 2013;36:283-8. Beighton D, Ludford R, Clark DT, Brailsford SR, Pankhurst CL, Tinsley GF, et al. Use of CHROMagar Candida medium for isolation of yeasts from dental samples. J Clin Microbiol 1995;33:3025-7. Sitheeque MA, Samaranayake LP. Chronic hyperplastic candidosis/candidiasis (candidal leukoplakia). Crit Rev Oral Biol Med 2003;14:253-67. McCullough M, Jaber M, Barrett AW, Bain L, Speight PM, Porter SR, et al. Oral yeast carriage correlates with presence of oral epithelial dysplasia. Oral Oncol 2002;38:391-3. Kumar RS, Ganvir S, Hazarey V. Candida and calcofluor white: Study in precancer and cancer. J Oral Maxillofac Pathol 2009;13:2-8. Samaranayake LP, MacFarlane TW, Lamey PJ, Ferguson MM. A comparison of oral rinse and imprint sampling techniques for the detection of yeast, coliform and Staphylococcus aureus carriage in the oral cavity. J Oral Pathol 1986;15:386-8. Farah CS, Lynch N, McCullough MJ. Oral fungal infections: An update for the general practitioner. Aust Dent J 2010;55 Suppl 1:48-54. Wu L, Feng J, Shi L, Shen X, Liu W, Zhou Z, et al. Candidal infection in oral leukoplakia: A clinicopathologic study of 396 patients from Eastern China. Ann Diagn Pathol 2013;17:37-40. Hornstein OP, Grässel R, Schirner E, Schell H. Oral candidiasis in leukoplakia and carcinoma of the oral cavity (author's transl). Dtsch Med Wochenschr 1979;104:1033-6. Davies AN, Brailsford SR, Beighton D. Oral candidosis in patients with advanced cancer. Oral Oncol 2006;42:698-702. Safdar A, Chaturvedi V, Cross EW, Park S, Bernard EM, Armstrong D, et al. Prospective study of Candida species in patients at a comprehensive cancer center. Antimicrob Agents Chemother 2001;45:2129-33. El-Kasem, EL-Shokry M, Mohamed AAA, Ebrahim AA. Antifungal susceptibility of oral Candida species isolated from patients with thalassemia major. J Bacteriol Mycol Open Access 2017;5:00160. Berkow EL, Lockhart SR. Fluconazole resistance in Candida species: A current perspective. Infect Drug Resist 2017;10:237-45. Pfaller MA, Hazen KC, Messer SA, Boyken L, Tendolkar S, Hollis RJ, et al. Comparison of results of fluconazole disk diffusion testing for Candida species with results from a central reference laboratory in the ARTEMIS global antifungal surveillance program. J Clin Microbiol 2004;42:3607-12. Darwazeh AM, Hammad MM, Al-Jamaei AA. The relationship between oral hygiene and oral colonization with Candida species in healthy adult subjects. Int J Dent Hyg 2010;8:128-33.